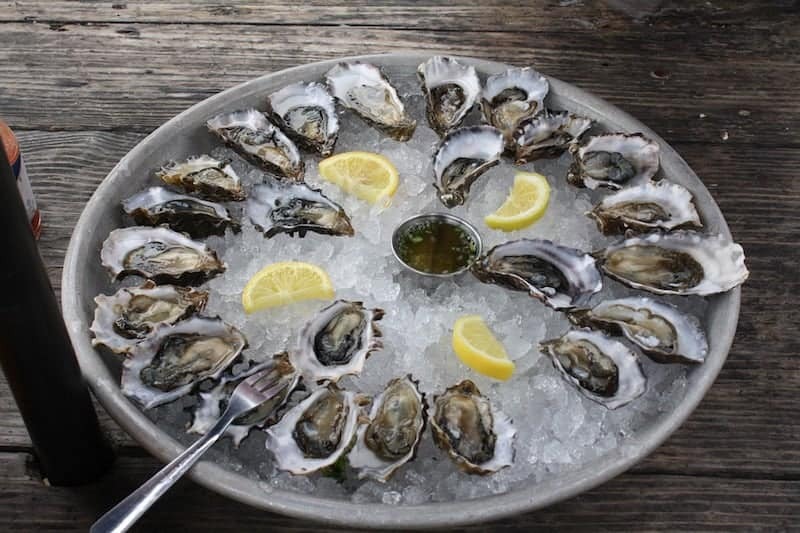 Oysters are a treat for many of us. This usually means we do not have them very often, especially at home. Because of this you may not know how to shuck (i.e open) an oyster the right way. Well rest assured, we are here to help. 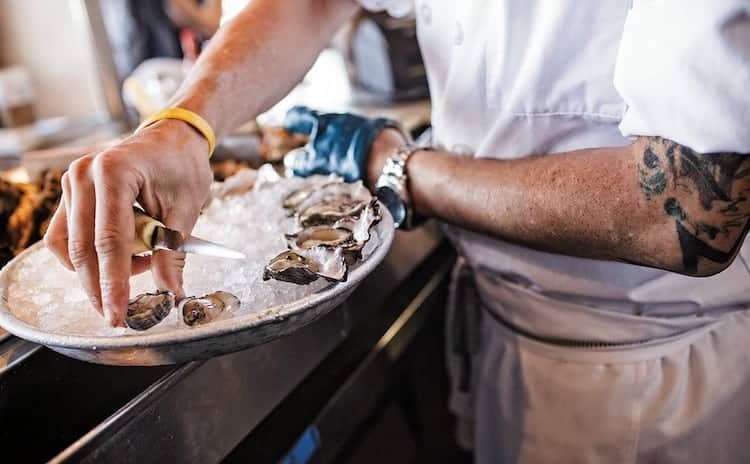 If you’re entertaining tonight and you want to serve up a few oysters for your guests, here’s how you shuck that clam without looking like a fool. This one is important to get right. 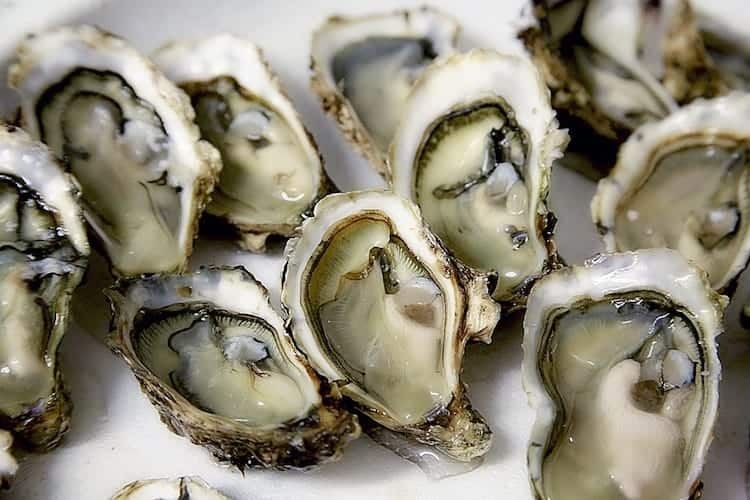 You might find discounts on many other seafood products in the stores but do not go for reduced-priced oysters before you read the package. Discount on seafood is often due to not being fresh. However, oysters must be sold alive by law. Still, you should take extra precaution. For instance, ensure that they are stored cup-side-down in the store. It’s best if they are on tiny bits of crushed ice. Firstly, the oysters should have a closed shell. When you buy them from the supermarket or fish-market they need to be clamped tightly shut. 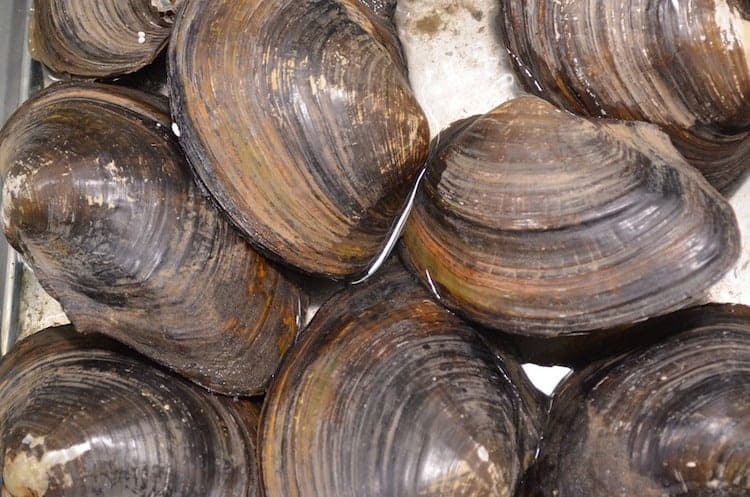 Open clam shells from the market is generally a sign that they are dead. Also, you should make your decision based on the smell. A fresh sea smell is what you are looking for. 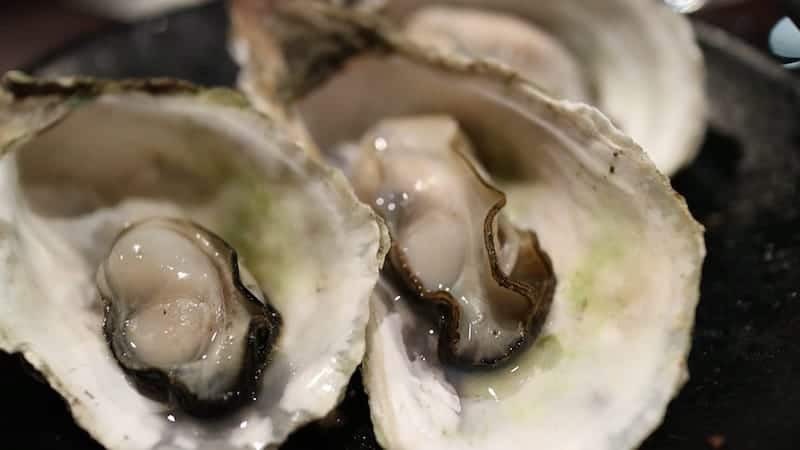 Fresh oyster smell is a combination of sweet and salty, just like when you are near sea. If it is a potent fishy smell than makes your nose turn.., well you know what to do. Another quick test is to place it in your palm. If it is surprisingly light, that indicates the water inside might have dried up, so it is no longer fresh. If it is heavy it indicates it is filled with seawater and a living tasty clam / oyster. Some crushed ice to keep the oysters fresh until you serve them. 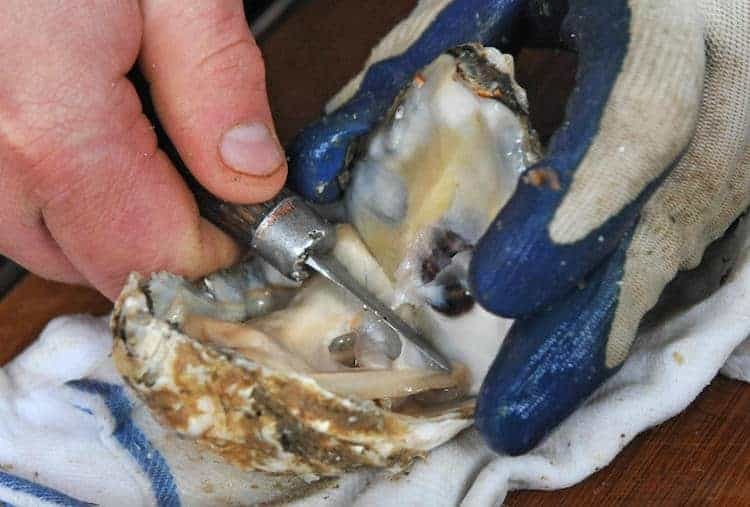 Clearly the best tool to use is one specifically designed for shucking oysters. An oyster or clam knife is the way to go. You can pick these up for very affordable prices on Amazon.com. Our recommended choice this year is the Victorinox Oyster Knife 2-3/4-Inch Hooked Tip. Ergonomically designed while being tough and easy to use, you will not go wrong with this one. 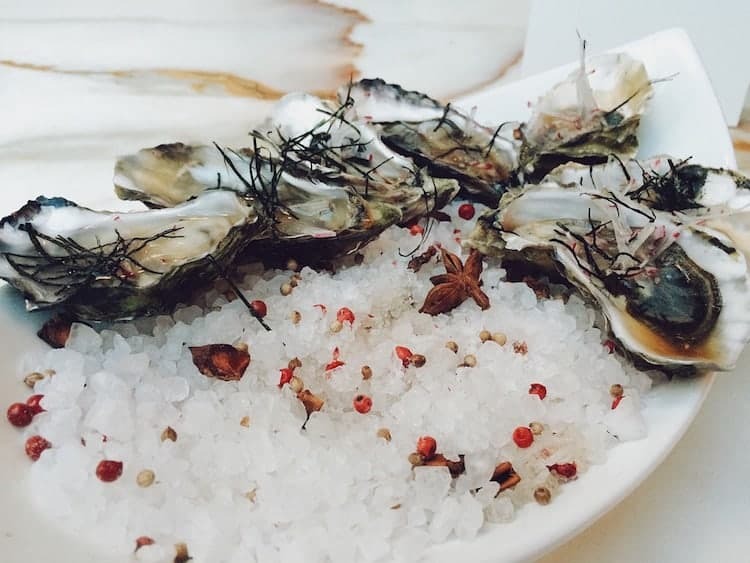 Understanding the anatomy of oysters will put you in good stead. Try taking a closer look at it, because that is how you can know how to handle it the right way while shucking. What you should know is that the muscle that connects the two sides of the shell, top and bottom, is called the hinge. The front part of the oyster that is round should be against the hinge. Bottom side of the shell is always cup-shaped while the flat shell is the top one. Bottom side of the shell is always cup-shaped while the flat shell is the top one. Before the actual shucking process begins it is good idea to wear a pair of rubber gloves. It is most likely that you will get cut when not wearing them, because the shell is very sharp. Next, you should scrub the shell clean using the stiff-bristle brush. This will help clean off the ocean grit. Scrubbed oysters should be rinsed in cold running water. Then, take it in your hand and make sure you are holding it cup-side down. The hinge should be turned so that it is facing towards you. Finally, the knife should be inserted into the hinge. Perform a twisting motion in order to separate the shells. You should feel a slight pop from the clam shell, when twisting your knife. After hearing that pop, you should move the knife along the top shell. Work it from hinge to the other side as close to the top as possible. Take care not to break the shell into pieces. When both shells get finally separated you can open the oyster. Run the knife alone the top shell and separate the remaining meat. You should check if any bits or grit are inside and if there are any, try to gently remove them. Finally, place the oyster on a plate of crushed ice ready to be served. Well done, you have successfully shucked an oyster. Now enjoy the delicate taste of the ocean from one of life’s natural treats.